Come hang with us........We Rock! Traditionally, abseiling is a tool used by climbers to access difficult areas that would otherwise be unreachable, to get off a cliff or mountain quickly or if there was no other way. 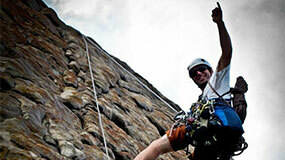 Today, abseiling is an activity used to provide participants with adrenalin charged fun! It can be used for purely recreational purposes, or team building – where it can be a powerful tool for enhancing communication skills, building trust and developing confidence. Margaret River Climbing Co. offers abseiling packages from recreation, social club events, schools, corporate groups to special occasions. Please download, print and complete our disclaimer document and bring it with you. That way you can spend more time doing the fun stuff - knowing we know you, and you’re in safe hands. Call us on 0415 970 522 to confirm your booking and pay via credit card using our secure BPoint facility.